Get the best Sekiro ending you can. 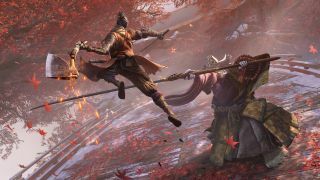 There are four different endings in Sekiro: Shadows Die Twice. The ending you get will depend on various decisions you make during the game. Read on if you want to find out how to unlock each of the different endings. This is the fastest—and easiest—ending to obtain. Once you've defeated the Guardian Ape and the Corrupted Monk, you'll head back to Ashina Castle where you'll meet up with Owl on the rooftop. You'll be given the choice to obey either him or Kuro. If you choose to obey Owl, two boss fights will be unlocked and you'll receive the Shura ending. Follow the steps above to reach the Ashina Castle rooftop and once again be given the choice to obey Owl or Kuro. This time, choose Kuro and fight Owl. Once Owl has been defeated, head to Isshin's tower to eavesdrop on a conversation between Isshin and Emma. Next, you want to head back to Kuro and eavesdrop on him from a corner in his room. Rest before talking to Emma and agreeing with her decision. Rest once more and talk to her again. Now head to the Old Grave Idol to find Emma and talk to her once more. Head to the Dilapidated Temple and eavesdrop on Emma's conversation with the Sculptor. Talk to Emma again and you'll receive a bell that you should use at the Buddha Statue. Head to the Hirata Estate and defeat two mini-bosses before heading to the room where you fought Lady Butterfly and prepare to fight a much tougher Owl. Once you've done that, proceed with the game normally and the ending will unlock once you beat the final boss. Reach the Ashina Castle rooftop again to be given the choice between obeying Owl or Kuro. Choose Kuro and do not return to the Hirata Estate. Follow the story as normal and this ending should unlock once you beat the final boss. Make your way, once again, to the Ashina Castle rooftop. Choose Kuro and defeat Owl when given the option. Head to the Temple Grounds Idol and dive into the pond to find the Holy Tome: Infested scroll (as well as a Prayer Bead). Now you'll want to head to the Inner Sanctum and talk to the Divine Child and give her the scroll. Talk to her and accept and eat any rice she offers you. Rest and talk to her, again eating any rice she gives you. Repeat until she asks you for a persimmon. Hand one over and she'll give you more rice. Keep talking to her until she gives you rice for Kuro. Give the rice to Kuro. Head back to the Inner Sanctum and talk to the Divine Child once more then leave. When you return she should no longer be there. To find her, head to the Hall of Illusion and talk to her in front of the Great Tree. She'll need another scroll, so head to the cave just left of where you used the bell to access this area. Give her the scroll and she'll ask for two serpent fruits. You'll need to obtain both serpent fruits from the Giant Serpents. The Fresh Fruit can be obtained by heading to the Senpou Temple and drop down to the right of the first Idol. You should spot a kite mechanism. Use the Puppeteer Ninjutsu on the enemy next to it and he'll use the kite for you. Head along the path and grapple the kite to find another area with a Giant Serpent. Kill him to receive the Fresh Fruit. For the Dried Fruit, head to the Bodhisattva Valley Idol. Follow the river in the opposite direction of the Guardian Ape boss fight. You'll find a cave containing another Giant Serpent. Stealth your way in and find a monkey beneath a grapple point. Use the Puppeteer Ninjutsu on the monkey and he will distract the Serpent long enough for you to head through the door and grab the Dried Fruit. Head back to the Inner Sanctum and hand the fruits over to the Divine Child. Rest and talk to her until she gives you Frozen Tears. Progress with the story as normal until you reach the final boss. You'll need to give Kuro the Frozen Tears to get the Return ending.